It’s not often you meet someone who loves bacteria. In fact, for most of us it’s the opposite—we constantly wash our hands, cover our coughs, wash our foods. But for Dr. Maria Marco of UC Davis and Dr. Mary Kable of the Western Human Nutrition Research Center, bacteria are the foundation of life. As microbiologists, they spend their days up to their arms in bacteria—sometimes literally. Much to our fortune, the power duo applied their passion to the dairy industry. Their recent study, The Core and Seasonal Microbiota of Raw Bovine Milk in Tanker Trucks and the Impact of Transfer to a Milk Processing Facility, looked at the bacterial composition of milk products and several milk processing plants. After all, to understand our milk, we first have to know what’s in it. I had the pleasure of sitting down with both of them to learn more. 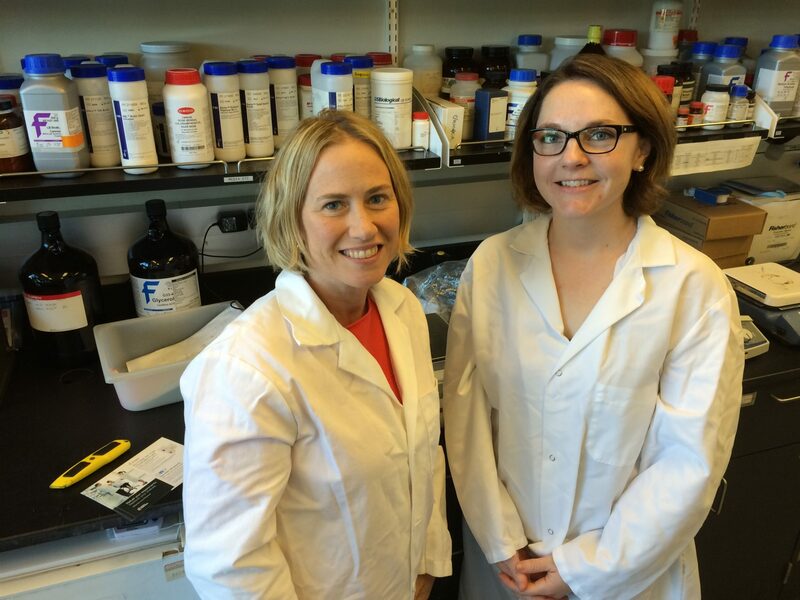 Dr. Maria Marco and Dr. Mary Kable in the Marco Lab at the University of California, Davis. Researchers at UC Davis have recently published a study that is already having an effect on some in the industry. Courtesy photo. Dr. Marco, your lab just completed a fascinating study. Can you give us a basic rundown of the project and its background? I’m a microbiologist, and I’ve always loved bacteria. Dairy has a long relationship with bacteria, so there was a natural affinity for me to look at and study the microbes in our milk. I started talking to dairy processors in California, and learned they were finding consistent problems with some of their products. It wasn’t clear why the problems were happening and without a cause it’s very difficult, if not impossible, to solve a problem. The first thing we needed to know was which microbes are in milk. So that’s where we started. We looked at the microbial community of milk when it arrived at the processing facilities. Dr. Kable and her team of undergraduate students collected about 900 samples of milk over 3 seasons for a couple of years. They collected the samples when the huge tanker trucks come up for inspection. Then we used a new technique to characterize the bacteria. Instead of looking at the cultures and colonies of all of these bacteria in Petri dishes, we looked at their DNA. Just like we all have different genes, so do bacteria. In fact, they’re even more diverse than we are. We extracted the DNA out of the bacteria and then used a method called 16S rRNA gene sequencing to identify the bacteria present in the milk. This is a universal method that can be applied in the soil, in our intestinal microbiota, in outer space… everywhere. The first key finding was that there’s a core microbiota in milk from California. There were core bacteria present in every single sample of milk. The second was that the microbes in milk varied depending on the season that the cows were milked. That makes sense if you think about what happens in the winter versus the summer. The climate is different, the temperature is different, the moisture level is different. The third, and last major finding, was at the end of the study. The study concluded by sampling milk just after it was moved into a silo. The milk goes off a tanker truck and gets pumped into these large storage tanks called silos—they’re enormous, several stories high. In some of those silos, the bacterial composition radically changed compared to what was in the truck. Something happened in some silos—we don’t know what yet—that changed the microbial content so that it looked very different from what was in the truck. The thing that was so interesting about that third finding was that it wasn’t universal. It only occurred in some of the silos. And it’s relatively short-term storage—they don’t hold the milk for more than a day. We were unable to link that finding with any metadata that we had. There was no relationship between the bacterial change and the amount of time the milk was in the silo, or the time since the silo had been cleaned. It doesn’t necessarily mean that none of those things caused this change. It might be that we need to look at more silos to find out exactly what caused it; it might be that we just need more complete records. Do you have a theory as to why the bacterial content would have changed? Yes, my theory is that some of those silos have developed an intrinsic microbiota in the same way that each of us has a microbiota. They’ve existed for so long and milk kept coming in and out of them. They might have creases where just a few bacterial cells don’t come out when it gets cleaned, or there might be just a tiny bit of biofilm that’s sticking so that when you put a nutritive food like milk in there and leave it for any length of time, the same bacterial community will incubate and come up again. What are your hopes for this project? How do you see it making a difference? Ultimately the goal is to help the industry prevent any waste and economic losses due to product-quality defects. I really feel like what we’ve given so far has already helped some members of the industry. They’re reviewing their procedures in a more informed way than before. You used samples from several different processors in California. What was it like collaborating with them? It was great working with them. They’re really interested in being on the cutting-edge of dairy production and just understanding how to get the most out of their product. They’re willing to invest in research, and this is essential to solving existing problems as well as creating new innovations. We couldn’t do this research without the willingness of the dairy processors to collaborate. Aside from providing samples, they know their product in a way that we don’t. I’ve appreciated their openness and enthusiasm to participate, and they actually have an interest in using the results we’ve collected. They’ve been really integral partners. Why is funding for this type of project so important? You know that California is the largest producer of milk in the United States, and the second largest producer of cheese after Wisconsin. This is the place in the United States to do innovative dairy research. And there’s definitely a need to really invest in understanding our dairy products. It’s a main source of nutrition, and has huge sustainability impacts when we look at how to feed many people at a low cost. Our focus on dairy food safety and quality gives greater confidence in our food systems to consumers and customers everywhere. I’m very thankful for the funds that the California Dairy Research Foundation (CDRF) provided for this. They provide a very vital contribution to dairy research. California should be the powerhouse of dairy research in the U.S. and I am really motivated to contribute to that. Dr. Kable, you started this project as a postdoctoral researcher with UC Davis. What drew you to Dr. Marco’s lab and to this project? I wanted to work for Maria for three important reasons. The first reason is because it’s really wonderful to find someone who looks like you. Maria was a woman in the sciences who was just getting tenure, and could show me the way to becoming that. Another reason was that I could see the students in her lab were doing really awesome projects and they were able to present those projects in a captivating way. The third, and possibly most important reason is because I wanted to learn how to do 16S rRNA analysis. It’s a big training investment to take someone on who doesn’t already know how to do that, and Maria was willing to take the risk and invest in me, which I really appreciated. I think it says a lot about her confidence in people’s ability to learn and also her own ability to mentor. I really liked this project. I learned a lot about cheese and large-scale milk production that I didn’t know before. What really brought a lot of success to the work was Dr. Kable’s tenacity—she’s very meticulous. The success of this paper and getting into this top tier microbiology journal was because she really analyzed the heck out of the data! Was there anything specific you learned about the industry? The scale. The scale that we produce dairy products on in this state is mind-boggling. You think you know what hundreds of thousands of gallons looks like, but it’s so big! What are your next steps for the project and this research? With this paper that just came out we look at the raw milk just as it hits the processing facility. Dr. Kable is now working on another paper about the milk in the intermediary steps. I have another Ph.D. student, Zeya, looking at the final product. Our ultimate goal is to be able to use what’s in the raw milk to predict how a cheese is going to turn out. If we can see early on that milk has certain bacteria with a high probability of causing a defect, maybe we can throw in an added treatment step to prevent problems from occurring. —Marissa Stein is a freelance writer. The California Dairy Research Foundation (CDRF) is a non-profit public research management corporation based in Davis, Ca. For more information about CDRF, see http://cdrf.org.